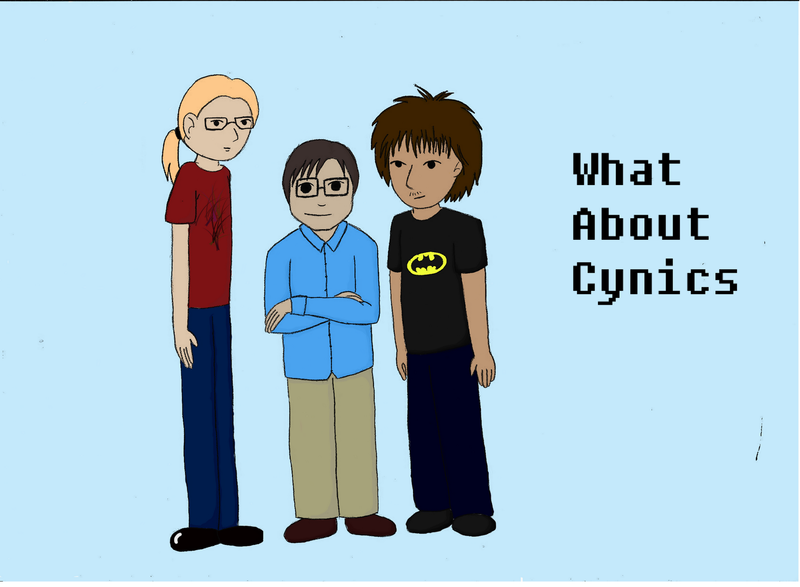 Fresh from the newly opened Schulzman Animation Studio, currently it's only piece of work, the opening to the What About Cynics Web Comic. Currently in production is a 1st full comic, of a glorious six panel length. It should be uploaded fairly soon. So until then, here are the principle characters of the web comic. Us. The idea originally came, because, who the hell doesn't like a web comic, my girlfriend is a skilled enough artist to make our machinations come to life, and between us with have cobbled together enough software on my computer to run a half decent operation. The process will work pretty much as you would imagine it, Helene draws the basic picture by hand, before we scan it in, and then begin colouring, cleaning up and other such slightly time intensive shenanigans, though even in the short time we (she) has been doing it, we (she) has gotten remarkably better. My main contributions to the process (there aren't many) are coming up with the storyboards/ideas, making tech work, and fetching popcorn. Helene basically fills in the other 85% of the skill bracket. Interestingly, in the time it took me to post this, the comic is basically done, the 1st issue, episode, comic thing, so why are you waiting here, this is just concept art/logo. But yeah, hope you enjoy, we aren't sure on a release pattern here, we will play it by ear. đất, đi thẳng vào trong rừng. tục bay trên không, sớm muộn cũng bị đối phương đuổi kịp. bùn, khả năng cử động nhỏ dần xuống còn vài chục mét.